“This is the last piece of history from the 1920’s,” said Leigh Cort who represents the Casa Marina Hotel and Restaurant. Built in 1925 the lovely Casa Marina Hotel sits Oceanside with its own walkway down to the dunes along the Atlantic making this not only a historic, but an idyllic getaway. With 23 parlor and bedroom suites to choose from, every room is a gem offering a relaxing stay. While there are lovely high rise hotels and buildings, none have the charm and warmth of the lovely Casa. My friend Rose Hammitt and I headed south the 19th of November just as Illinois began to have a major chill in the air with thoughts of white sand beaches, fun dining and a little Florida history during our stay. As we headed out of the drive my husband Keith waved us on with the words, “I am trusting you to God and Garmin” as we loaded in the directions, said a travel prayer and headed south. The Casa Marina Hotel is styled in Spanish-Mediterranean design that their website said, “brought a ‘first’ to the beach…a fireproof building composed of stucco, concrete, tile and an automatic sprinkler system”. The hotel opened on Saturday, June 6, 1925 when Florida experienced its first land boom. The Casa Marina began as a two-story tall hotel with 60 rooms drawing visitors then, like now, for the warmth, water and beach boardwalk. The Casa reigned supreme during the roaring twenties, the Depression Era 30’s and the start of the 1940’s before the war. As we glanced at the historic pictures provided by Jacksonville Beaches Museum where revelers drove their cars onto the beach, surfed the waves and posed in decades ago attire we wondered if walls could talk just what stories the Casa would tell! 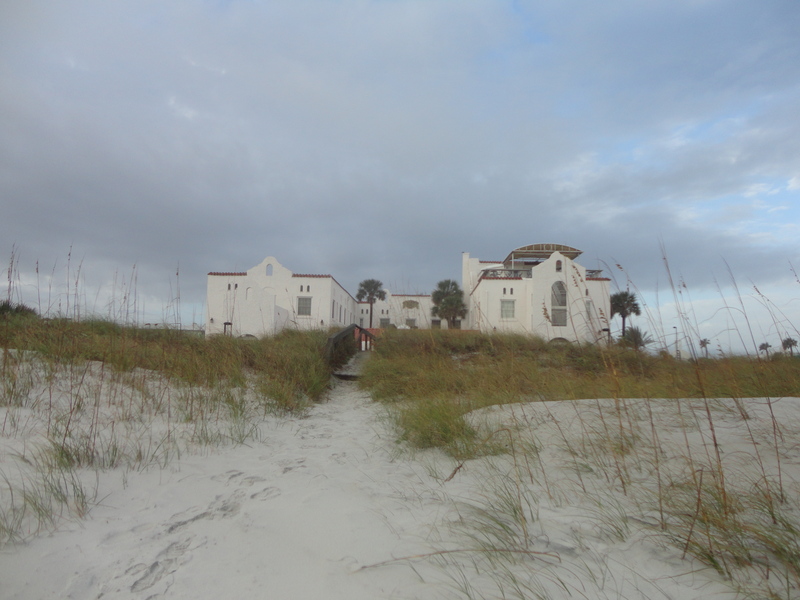 Like many other historic hotels, the Casa Marina was secured as military housing during World War II. After the war, it was a private residence, tea room, apartments, restaurant and more. When the Casa was revamped in 1991, the structure over time had gained a veranda and 3rd-story penthouse that offers a panoramic view of the beach. It is now the Penthouse Lounge where lunches are served and tapas and Martinis boom along with evening entertainment pairing food and fun. Chef Aaron Webb oversees the wonderful food selections both at the hotel and a great restaurant Zeta’s a few blocks away. Breakfast is included with accommodations. The Penthouse Lounge was our first stop after a quick glimpse of our luxurious room we met up with Leigh Cort who provided us an overview of the area before we set out to conquer Jacksonville Beach. The view from the Lounge allowed us to enjoy the clouds that skidded over the nearby ocean that was beautiful even in the late afternoon mist. The next day dawned sunny and our first mission besides breakfast was a walk on the beach. Make plans to visit to this historic hotel and make memories of your own. We were amazed to learn that rates as low as $89 are offered on some weekdays depending on events. This hotel is a wedding destination and they are known for their wedding packages. Sara Martinson, the Front Desk Manager said to call for specials! Located at 691 1st. St. N., Jacksonville Beach, FL. Call (904) 746-4517 for reservations or log onto http://casamarinahotel.reachlocal.net/ for more information. its a very nice post, The hotel in this post is looking very beautiful, i think its unique idea to make hotel in this place. I like it. Best of luck.